Railpictures.ca - Michael Berry Photo: CP F94 has five geeps (CP 2307, CP 2280, CP 2252, CP 4428 & CP 30324) with cars for the Lacolle Sub as it passes Lasalle Yard. Two of the geeps will be set off at Delson. | Railpictures.ca – Canadian Railway Photography – photographie ferroviaire Canadienne. 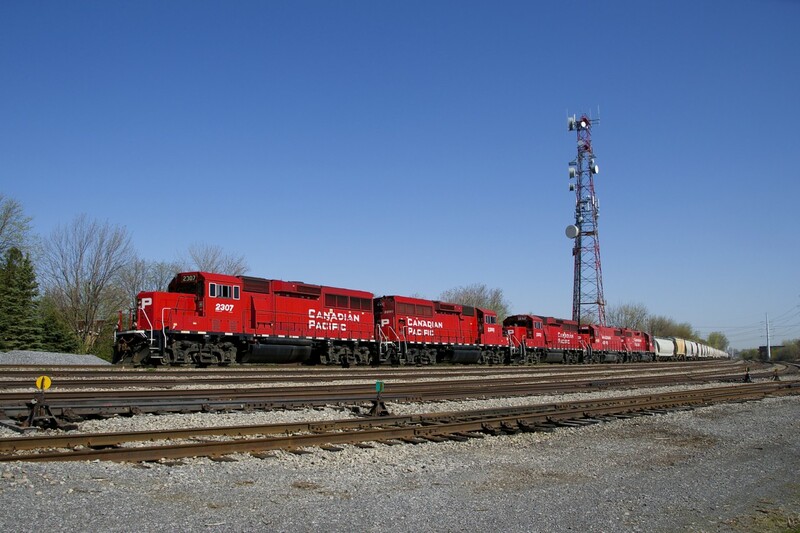 Caption: CP F94 has five geeps (CP 2307, CP 2280, CP 2252, CP 4428 & CP 30324) with cars for the Lacolle Sub as it passes Lasalle Yard. Two of the geeps will be set off at Delson. I hope I can catch something like this before the summer is over. I really like the shade of red on the ECO’s.